I have searched and have had a hard time finding a solid answer on what are the best size tires and wheels to run for auto-x. I currently have LSS wheels on my Exige with spacers and I know I could run something much better for more grip. These sizes referenced should be for stock body only. This thread should hopefully answer some questions people have in the future. Pic of my Exige attached just because. For us mere mortals with out body work 225/45/15 Front wheels (or 16s if you have Kodiaks) is the way to go! I have not had any of the understeer that I suffered from during previous seasons. That being said, I'm also on better rubber now and have more experience. I'm not sure about the rear yet. Whats the wheel size and offset? I'm currently using a 15X8 +25 with a 20mm spacer. There is definately better options out there though. The reason for the large spacer is the spoke design, I needed 20mm to clear the front caliper. plenty of inboard room, but with my suspension settings I get a little bit of rubbing on the outer sidewall in heavy cornering. So effectively a 15x8 +5 front wheel with 225/45/r15 tire? I think there needs to be a "class" component to this discussion, if you're talking about auto-x. Let's assume SCCA auto-x classing rules for the sake of this discussion. 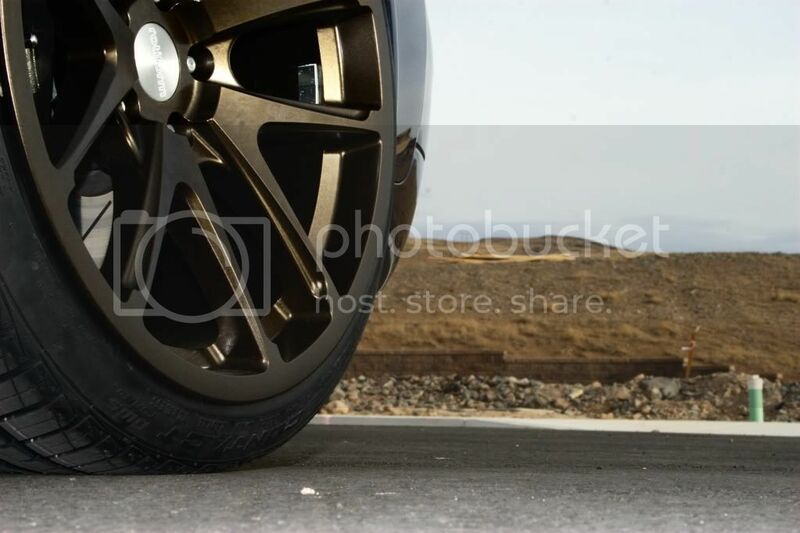 17x7.5 rear wheels with offset as close to +44 as you can get without rubbing holes in your wheel liners. This will take some tuning. Maximizing the front track width and minimizing the rear will cause less weight transfer up front and more weight transfer in the rear, increasing front grip relative to rear grip. You can fit a 225/45/15 on 6.5" wide wheels. They are pinched and I think you're in the region of diminishing returns. 225/45/15 BFG Rival S tires were only 1/8" wider in section width than 205/50/15 RE71Rs. I have a set of 205/50/15 Rival S tires I will be trying out against my fresh set of RE71Rs for a better back-to-back comparison. With the 245/40/17 rear, top speed in 2nd gear is 64 mph (confirmed many times by GPS data). This is a pretty good speed for street-tired auto-x cars with < 200 whp. I don't think there is consensus opinion on what is "best". That's always going to depend on setup and preference. And Not all tires are created equal at any given stamped width (see thread on Hoosier A6 vs A7). If you're sticking with street tires it probably depends on what sizes are available; the RE71R for example doesn't come in a useful 15" for the front. Check out the BWR bogarts and Team Dynamics 1.2 they carry also; both in 15x8 and 17x9. They were running 225 and 245 width RS3s on them. (Though I don't see why you can't run a 245 on an 8" rear - the 9" may be stretching a 245). They don't advertise the offsets on the Bogarts, but the TD1.2s are in their site. The serious SSM competitors are running 275s or more on 10 and 11" wheels I think - they can chime in here - but with cut clams obviously. Subscribed for the discussion though, as I'll be looking to upgrade my rolling stock this off-season as well hopefully. True I suppose classes will make the difference. I was implying this is more for the weekend warrior Auto-x guy. Street tires and no clam modifications. I am running tuner class cause I didnt know which other class to run with my mods. If you're sticking with street tires it probably depends on what sizes are available; the RE71R for example doesn't come in a useful 15" for the front. The 205/50/15 RE71R is my current favorite front tire for Super Street. Yes, sorry for SS that's probably king of the hill. If you're running a class that allows wider, there isn't an RE71R in 15" that's wider than 205 (is what I should have said). I was looking for 225 width 15s recently - choices are BFG rival S or RS3 in a street tire. R1R I think is also available and maybe an R888 but for autocross it sounds like most folks have a hard time getting enough heat in the 888, so the new crop of top street tires may actually be faster. You can get most of the fast street tires in a 16" 225 that'll work if it'll fit on the car. The Ho Hos are available in any size we would want basically. Last edited by RideMooch; 09-18-2015 at 12:05 PM. Yeah, I can see what you're saying. I defaulted to SS... because that's what I know. haha. 205/50/15 on an 8" rim would be a really good fit for that tire width. Andy Hollis talked about the performance gains of using a 15x9 wheel with 225 tires vs. 15x8 with 225 tires and stated a "~1 second" improvement with the wider wheel. The same logic would apply for for a 205 on an 8" wheel vs. a narrower wheel. If I were running street tires in a "tuner" class or street tire SSP, I'd try to fit a 225/45/15 + 15x8.5" wide front wheel and a 255/40/17 + 17x9 rear wheel. Camber would be somewhere around -2.8 front and -2.6 rear depending on spring and bar setup. 949Racing is coming out with a 17x9 4x100 wheel. I'd be really interested to see if someone could make a 15x9 and 17x9 setup work with the right ride height and camber. If not, a 15x8 and 17x9 setup would be pretty fast, as well. The 949 15x8 17x9 set up is my goal for this winter, along with an LSD. It would be hard to stuff a 15x9 under the front fender. What are the offsets we are talking about here? Im sure a 17x9 would fit great depending on the offset. the 15x8 on 949 racing site has a +36 offset which is pretty high. You would need to run some pretty good spacers. I would like to see more wheels with a - offset. I think a 15x9 with a low offset would probably fit. Ive been trying to use this calculator here but I need more measurements to get it accurate. I have had stanced cars in the past and the lack of offset information on this site is annoying. In order to use every bit of space in the wheel well you need to know offsets. I normally wouldn't argue with Hollis but I have a hard time believing a 225 on a 9" rim is worth a second - anyway that's really stretched. I mean you can put a 245 on an 8" wheel pretty square which is why I was questioning even needing a 9 out back if you aren't using more than a 245. Anyway, I suspect you'll never get a 9" On the front of our cars anyway as it takes careful fitment for a 225 on 8" wheels. 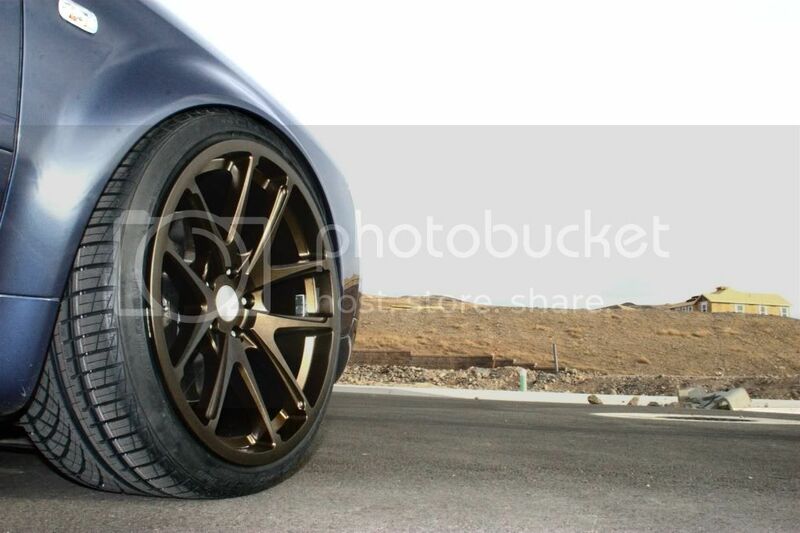 I still think 15x8 and 17x9 with 225/246 is likely the best you can do reasonably. This as I said before limits tire choice. As Andy would say, the only way to find out is to test both setups! I understand that gets expensive, though. The 225 on 9" wheels has been a hot setup for a while in the Miata community. Whether it's worth a second on a typical road course... ? 245 on an 8" wheel is a bit of a pinch, in my opinion. STU Subarus and EVOs are using 245s with 9.5" and 10" wide wheels. They don't look very stretched. 245s on 9" wheels look almost square. Most of the setups being discussed here would require spacers to fit perfectly. If you ask Fred, I imagine BWR would produce custom thickness spacers (hub centric or not) for any of these applications. maniac2 and RoHo like this. Bogarts, and I run about half an inch worth of spacer in the rear to clear the lower control arms. I think the best setup ignoring any rules for stock body work would be 225 front 255 rear on 8 inch wide fronts and 9 inch wide rears. I've seen 275 rear done on stock bodywork with some compromise in ride height. Its a sticky and large a front as you can get on these wheels.